Spaceflight enthusiasts will soon be able to download the 321 Launch app to watch live rocket launches from the comfort of an office or living room, and to do so in an interactive way that goes beyond existing 2D feeds. A new app called 321 Launch, coming out this week, promises to give spaceflight enthusiasts an interactive mobile-device experience during real-time rocket launches. The interactive app comes out tomorrow (March 29) on the Google Play Store and on iOS, and its developers have designed it to give people a taste of what it feels like to be at a rocket launch in person, especially when Cape Canaveral in Florida is too great a distance to travel to. 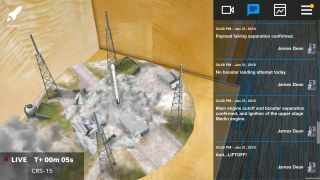 321 Launch is a new interactive app, developed by USA Today, that provides real-time data on live rocket launches and also models the stages of rocket assembly for educational purposes. Soto also gave Space.com a chance to try the app out. The smooth interface of 321 Launch tells users where in the sky a launch is happening, similar to what skywatching apps provide. The app also models the assembly of a Falcon 9 SpaceX rocket from start to finish, which users can watch in 3D when no launch is happening. Watching the launch, users see the scenes play out in miniature size against their surroundings. Soto said that 321 Launch is designed to model SpaceX Falcon 9 rockets, but the team plans to demonstrate United Launch Alliance Atlas rockets in the future as well. 321 Launch is also set up to provide live information from space experts at Florida Today, another Gannett Co. publication. The first live launch to appear on the app is the April 2 Falcon 9 flight. During the rocket-assembly module, the screen prompts the viewer to drag or pull their finger along arrows on the screen to bring up the next sequence. The directions these arrows face are not just swipe prompts; they also teach the user a bit about the forces, motions, and assembly techniques that happen in real life. As the rocket progresses through the launch, a user can select one of several menu buttons to tailor the experience to what interests them most. If a viewer wants to watch a live launch and see space-reporter commentary, a simple touch on the right side of the screen allows that user to see both views side by side. And if you join a few minutes too late, you can still start the app, and the rocket will take off and accelerate in time to catch up to where it is in real time, according to Soto. Since the visuals play out in miniature against your surroundings, you can remain connected to your physical location, another benefit of the app design. The simulation model on the 321 app asks the user to designate a square block upon which to animate the assembly, launch and re-entry of a Falcon 9 SpaceX rocket. "We made several visits to Kennedy Space Center but I'll never forget the first time I went down. The rich history of the space program, having a private tour through the actual space center next to all the launch pads, the history, getting to see mission control, such an inspiring moment for us," Soto said about the visit to Cape Canaveral earlier this year that motivated his team to develop 321 Launch and all its features. The team then watched a Falcon 9 rocket launch on site, and Soto recalled a colleague's reaction to the experience. "One of my developers, he was pretty taken aback by the whole moment, went back into the press box and proclaimed loudly, 'I'm into space now!'" The 321 Launch app is available for download on March 29 at 2 p.m. EST on the Google Play Store, and between 12 and 4 p.m. on iOS.